The innovative USB Host Printing is a feature that will be a benefit to Performance, Ease of Use or Security. When printing PDF documents the user simply plugs in their USB flash drive into the USB Host Interface located directly on the right side of the Control Panel on select Kyocera Multifunctional Products (MFPs). The Removable Memory Box feature will then display all the PDF files located on the root of the USB flash drive. 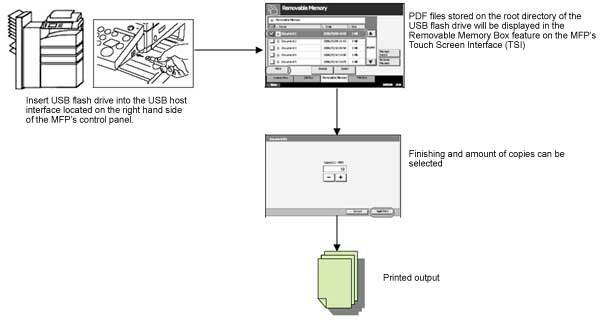 The user can then select the PDF document and the desired document/page attributes such as duplex and finishing when printing the PDF document from the USB flash drive. Since the PDF file prints directly from the USB flash drive to the MFP, there is no residual data that remains on the MFP, assuring that any PDF document that is printed remains secure and confidential.